Brattle Street Church opened its doors in December 1699, much to the consternation of the other three Boston churches. A new congregation meant further division in the town. A new congregation also meant less income, since the upkeep of ministers and meetinghouses was provided by taxes. Equally disturbing were the new congregation's startling innovations, one of which was their stated intent to include not only "male communicants" in the election of ministers but "every baptized adult person who contributes to the maintenance." That meant women as well as men. Chebacco, near Ipswich, also wanted a meetinghouse of their own. Ipswich opposed this, even passing a law that no meetinghouse be built by the men of Chebacco. No one thought of applying the ban to the women. The women got together, hired some men from outside Ipswich jurisdiction and raised their meetinghouse. Ipswich authority was furious and issued warrants for the arrest of all those who had aided the mutinous women. The courts dismissed the suit. These delightful stories, tucked away in the history books, exist alongside the more horrific stories of Anne Hutchinson and Mary Dyer. It was feared that if Anne Hutchinson's freethinking spread, the English King might impose royal rule on the colony. (Also, Anne Hutchinson argued that God's grace was so all-important that good works or "the secondary externals of conventional morality" mattered little. Opponents considered her arguing against the "covenant of Good works" to be destructive of society.) After a trial in which a stubborn Hutchinson refused to compromise, she was excommunicated for heresy and sent into exile in 1636. 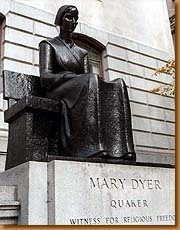 Quaker Mary Dyer, whose bronze statue stands on the Boston Commons, was a gentlewoman by birth and a rebel by trade. Quakers were considered dangerous subversives in 17th century England, where they were flogged and deported or hanged. Mary Dyer came to Massachusetts and was banished from Boston with a warning that she would be hanged if she returned. Within a month she did return, was banished again and, and after returning again, she was hanged in 1660. If life in Pilgrim and Puritan New England--with its small population, brief history and common language and culture--was so contradictory and complex, how much more complicated and confusing must be an area of the world like the Balkans with its numerous ethnic populations, long-remembered histories, and multiple languages and culture. Someone once warned us about the "terrible simplifiers"--those who would take complex issues and complex humans and categorize then into simple groupings of good and evil, right and wrong. Of course, there are issues and people whose actions are of such benefit or such harm that labels can be applied, but as with early Massachusetts, historical reality is far more complex than the terrible simplifiers make it out to be. Henry David Thoreau wrote, "Our life is frittered away by detail. Simplify, simplify." Simplifying is personally beneficial as a means of maintaining clarity about our lives, but the vibrancy and complexity of life is too great to fit into easy judgments and pat answers.